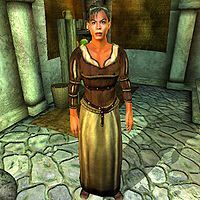 Clesa is a Redguard ostler who sells White Horses at Horse Whisperer Stables outside Anvil. While her husband Ernest reluctantly takes care of tending the horses and luring potential customers inside, Clesa handles the business and never leaves the stables. She gets out of bed every morning at 6am and wanders around for two hours before she unlocks the door at 8am. For the next twelve hours, the stables will be open and Clesa will be available for a transaction at all times, even between noon and 2pm, when she is having her lunch. At 6pm, she sits down and enjoys her dinner until closing time at 8pm. Once the stables are locked up, she relaxes until her bedtime at 10pm. Clesa will sell horses 24 hours a day, but the door to the stables will be locked outside the regular opening times. Clesa wears a middle-class outfit consisting of a brown shirt, light brown linens, and a pair of rough leather shoes. She arms herself with an iron shortsword and carries a few pieces of gold. When meeting her for the first time, she will introduce herself: "I'm Clesa. My husband and I run the Horse Whisperer, the finest stables in Anvil County" and when asked about Anvil she will announce that: "While you're in Anvil, we'll treat your horse like an honored guest." When asked for a horse, she will respond: "We have the finest white horses in Cyrodiil. None are hardier, and only the black horses of Cheydinhal are faster." If you reject the 4000 gold price, she will say: "Come back if you change your mind. We are the only place in Cyrodiil where you can get the magnificent White horse." If you accept the bargain, she will point you towards her husband outside: "Wonderful! Go out front. Ernest will have the White saddled and ready for you." This page was last modified on 2 April 2019, at 14:07.